As in previous years the course is being run in partnership with the British Association for Sport and the Law. Leicester De Montfort Law School is a leading provider of high quality distance learning post graduate legal education. It also runs a highly successful LLM in Sports Law and Practice by Distance Learning. This certificate programme builds on this success by offering practitioner focused face to face lectures in London in combination with Distance Learning modules. Study over a period of 12 months. No examinations – assessed by coursework. Award from De Montfort University Leicester. Practising lawyers or law graduates/trainees with an interest in developing a career in sports law, sports industry professionals and representatives of sports governing bodies, such as the Football Association. 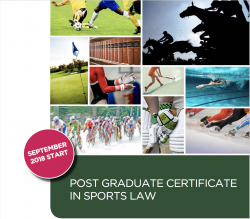 To obtain the certificate a student will study: Foundations of Sports Law and the Sports Regulatory regime – a Distance Learning module headed up by Andy Gray (Head of the Sports Law Unit at Leicester De Montfort Law School). This module is studied from September to January. Foundations of Sports Law and the Sports Regulatory regime – a Distance Learning module headed up by Andy Gray (Head of the Sports Law Unit at Leicester De Montfort Law School). This module is studied from September to January. Practice Perspectives on Sports Law – this Module, which will run from September to April, is supported by a series of lectures to be held in London venues (London Lectures) and given by leading sports law practitioners. A minimum attendance requirement (50%) applies to these events and the module is assessed by coursework. In addition, One module from the following: Representing the Athlete/Player; The Sports Participant in the Courts. The module chosen will run from January to June. No! The course is assessed by coursework only, set and marked by academic staff at Leicester De Montfort Law School. Typically, students will undertake 1 x 5,000 word assignment in each module. The London Lectures – Do I have to attend? Yes. The London Lectures are an integral part of this scheme. Leading sports lawyers from practice will meet at selected London venues. those currently planned for 2018/2019 include lectures at Charles Russell Speechlys, Dentons UKMEA, DLA Piper and The Football Association, Wembley Stadium. The precise number of lectures to be delivered is to be confirmed but will not exceed 18 evening sessions in total. To get the Certificate you will need to achieve 50% attendance at these events. If you are interested in the Certificate, but do not want to attend the lectures, or cannot guarantee attendance levels, you can join our LLM course in the normal way. For more details contact Andrew Pini +44 (0)20 7017 5906. What support does Leicester De Montfort Law School give me? If you are enrolled on the Certificate you are a De Montfort University student. That means that you will be invited to our Saturday study days (three a year). You will have access for academic purposes to our online databases. You will have ongoing access to the Course Team who will happily liaise and guide by telephone or electronically. And of course you will have Course Materials provided by Leicester De Montfort Law School. How much time will it take for the Certificate? You will attend the programme of lectures. In addition study of the accompanying modules will demand ongoing time input reading source material and writing assignments. For that input you will be able to achieve a high quality Post Graduate qualification, the opportunity to meet other Sports law Practitioners at the lectures and other Sports Law students from around the world at Leicester De Montfort study days. It can also be part of your CPD portfolio. Yes. A student who successfully attains the Certificate will be given automatic entry to our LLM Course – a Masters Degree in Sports Law can obtained after one further year of study. The full Certificate Course is £3,250 for the full year though see above details of the early bird discount.